EARLIER THIS WEEK, we wrote about the difficulties Sinn Féin president Gerry Adams had dealing with the detail of the party’s economic proposals during a Morning Ireland interview. This difficulty highlighted what we felt was a problem for Sinn Féin: its leader was saying the party needed to be ready for government yet couldn’t deal with the specifics of the policies and what the red line issues are before it goes into government. Earlier this month we also scrutinised some of the party’s economic policies and outlined some of the difficulties that will arise from implementing them. In response to our piece this week, Sinn Féin offered TheJournal.ie an interview with its finance spokesperson Pearse Doherty to thrash out the specifics of the party’s economic proposals. That local authorities are being “put on notice” of the need to reduce property tax after Sinn Féin passed motions in several councils in recent weeks. But Doherty admitted that the likelihood of any property tax cuts is dependent on information from central government that is not yet available and could not clearly identify where the shortfall in revenue would be made up. Doherty insisted that a 48 per cent tax on incomes over €100,000 was progressive and fair and said he simply did not believe that senior executives in foreign companies would be dissuaded from coming to Ireland by this measure. He couldn’t say how much the party’s proposed wealth tax would raise but suggested that based on the Nevin Institute’s proposal of a 0.6 per cent tax on wealth that Sinn Féin’s 1 per cent tax would raise around €300 million. He was unable to say if an online betting tax had been introduced successfully in any other country, but noted that the government here intends to introduce one in the coming weeks. He said that Sinn Féin’s economic proposals are formulated by the party’s parliamentary assistants some of whom have done taxation courses. He said that outside economists also look at their budgetary documents. He claimed that the Department of Finance does not have a “fountain of wisdom” that determines how economic policies interact with each other and said they get policy costing wrong all the time. 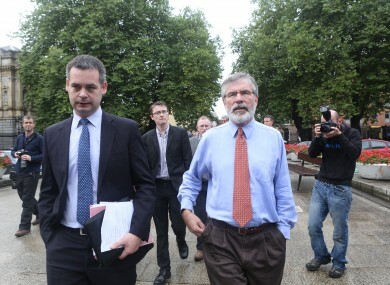 He said that Sinn Féin would target efficiencies in departments if in government but was not forthcoming on specifics. Hugh O’Connell, TheJournal.ie Political Editor: Is the abolition of the property tax a pre-condition of Sinn Féin going into government? Pearse Doherty, Sinn Féin TD and finance spokesperson: Yeah, Sinn Féin have made it clear: if in government [after] the next election we’re going to abolish the property tax. Gerry Adams has made it clear that we’re going to make no commitments that we can’t deliver on. HOC: So it will be in your programme for government, whoever you are in coalition with, that you must gain a commitment from another party that they’re going to abolish the property tax? PD: Yes, we are saying that we will not enter into government unless we abolish the property tax and that’s very clear. We’ve showed in our alternative budget for example that we want to reintroduce the Non-Principal Private Residence tax. This is a tax we actually called for before it was ever introduced, which is a tax, more commonly known, on second homes and we want to increase the actual value of that. HOC: Will that make up the shortfall [from abolition of the property tax]? PD: No, it will bring in about €160 million but then a suite of other measures will deal with the other shortfall. There is also allegations from our opponents – and sure that’s just part of the political banter – that we’ve committed to pay back all the property tax that’s paid, that’s not true. We’ve actually written legislation to repeal the property tax and we’ve said that in the year of abolition if any property tax was paid then it will be actually refunded. So, for example, if you decided on the 1 January to abolish the property tax and something that you paid in advance – money that was due on 1 January – then that would be repaid. But it’s not every single penny that’s been paid over the years until we get into government – that’s nonsense. PD: No, we have. We’ve made a very clear commitment to the public that, again, after the next general election, if we have the mandate to be in government we’ll abolish it. But there’s a couple of steps. The second thing we’ve said to the public is that if we are in any position of power that we will support a reduction in the property tax to the maximum amount in any local authority that we’re involved in. What you’ve seen in some local authorities is that our members have put the local authority on notice that we want the property tax [cut]. We’re very conscious of the legislation, we have to look at the budgetary measures, we have to look at the revenue, we need to also know how much money will come from central government. None of that [information] is available. We’ve been pushing the government to bring forward the regulations – which they’re intending to do within the next two weeks – about the considerations that local authorities will have to have to bring that about. But our intention is where possible to reduce the local property tax by 15 per cent. The motions that have been passed doesn’t give effect to a 15 per cent reduction. HOC: It’s a very clear commitment though. Eoin Ó Broin [Sinn Féin councillor and economic advisor] before the local election acknowledged pretty much that central government isn’t going to make up the money you cut in local property tax. But then Sinn Féin said recently in a comment to us that in the first instance you will look to central government [to make up] the shortfall. So, which is it? PD: Well Eoin Ó Broin made those comments in response to Labour actually committing to reduce the local property tax in some urban areas as a pre-election commitment and we challenged them and said basically you’re [central government] telling us that central government aren’t going to make up the shortfall which in our view they should. HOC: … But it might not be possible. You’d admit that wouldn’t you? Let’s take Cork County Council for example. They’re was a motion passed to reduce local property tax by 15 per cent. That amounts to a €3.75 million shortfall in revenue that they took in property tax last year. So you’re going to have to find €3.75 million. Now central government is probably not going to give it to you and in the second instance Sinn Féin said “efficiencies and reductions in office holders expenses” will be targetted. Are you telling me that there is €3.75 million in there? PD: No, but we will be looking in every budget at a local authority level, you’ll be looking to see if you can make efficiencies, if you can make savings in any area. PD: Yeah and now as a larger force we’ll continue to put a focus in relation to that. But obviously you’re not going to make that type of money out from there. We need first of all full knowledge of what central government, what type of funding is going to be made available to local government. Those figures aren’t there. But Sinn Féin has made it very clear that we want to see a reduction in the 15 per cent of property tax. This is an interim proposal because what we want to do is scrap it and we want to actually fund local government properly through central government and the other measures, revenue measures that it has itself. HOC: But you’d admit though that it might not be possible in all instances where a motion has been passed to cut it by 15 per cent that you will actually realistically able to achieve that? PD: They’re non-binding. We have to wait and that’s why we are pursuing the government to actually publish the regulations to see what local authorities will have to legally conform with in relation to being able to raise or lower the local property tax. Once that’s available and then once we know the funding that will be made available from central government to the local authorities it is then we’ll be able to make a decision. Our big concern is because Revenue have to be notified of any change [a local authority makes to its property tax rate] by the end of September that time is actually running out for local authorities to make these decisions. There will also be a period of consultation. So we’re very concerned that the government are actually holding back on this to actually frustrate the attempts of any local authority of actually reducing or indeed increasing the local property tax if they so wished. HOC: Let’s talk about your tax proposals. The overall argument of it is that they would change people’s behaviour. So let’s take the 48 per cent tax on income over €100,000. You would have senior executives looking at locating to Ireland who would face a marginal tax rate of 62 per cent. You would admit that, yeah? That’s what would happen? HOC: … But there’s a marginal rate there of 62 per cent on people over €100,000, yes? PD: Well, if you look at it at the minute you’re talking about a 7 per cent increase on what the marginal rate is at this point in time. Now you can talk about the marginal rate, it’s seven cent extra on every euro that they earn above a hundred .Nobody pays their effective tax rate at the marginal level. They don’t. It’s an effective tax rate, because there are so many reliefs that are available. Nobody pays 62 per cent or even 59 per cent of their income on taxation. But what we believe is fair that for every euro that you earn above €100,000 that you pay seven cent more. For every euro that you earn below that your tax system remains the same. HOC: Would you not get a lot of people though trying to come in under the bands? The more tax bands that you have the more you have people trying to play the tax bands so that they come in maybe at the 41 per cent rate rather than the 48 per cent rate. You’re encouraging people to try and manipulate their income to the extent that they would avoid the 48 per cent rate…. PD: I don’t think that argument holds. You could actually make that argument in relation to the 20 per cent and the 41 per cent. Are people out there who are working just wanting to stay under the €32,800 threshold. I don’t think they are because if they get a wage increase and they go up to €34,000 sure they know that the first €32,800 is going to be applied at the 20 per cent rate. That’s why it’s progressive, it’s only the bit above that that will be applied at the higher rate. You know the perception again by our political opponents is that everybody is going to be taxed at this level – at 48 per cent – it’s not it’s only the income above that and we think it’s fair. It all comes down to questions and decisions and options and, you know, choices. And if you want to have public services fit for purpose, if you want to, on the other end of the scale, take 300,000 workers out of paying the USC tax net or indeed if you want to abolish the property tax – which is on average €276 for 1.8 million people – then you have to find the money somewhere and we believe that those earning above €100,000 can afford for that portion above to give seven cent extra in every euro above that. PD: Why would it cripple foreign direct investment? PD: Well first of all I don’t believe that and second is that there is actually things within our tax code that Sinn Féin are critical of them [for example] in relation to SARP (the Special Assignee Relief Programme) for those people who come from outside of our jurisdiction that actually get huge tax write-offs as if they’re coming in here as a ‘key person’ as it’s called in a foreign direct investment company located in Ireland where a large portion of their tax liability is written off. [That's] something that’s not available to any Irish resident but is available to those foreigners who want to come here working in multinational companies. PD: It’s international best practice. If you look at, for example, France where much of our wealth tax is modelled, we’ve looked at the legislation. When we designed this we’ve had people in translating French for us and we’ve looked at the legislation, we’ve talked to key people in that area. We’ve looked at other areas where wealth tax is operating and for example pensions are not included in any wealth tax. A wealth tax is also levied on net assets so your liabilities are taken out of it, your mortgage, your debts and so on. It’s not levied on businesses because obviously that would cripple business. It’s not levied on agricultural farmland because they are seen as businesses themselves. So probably the difference that we have is unique to the Irish model of wealth tax is we have excluded 20 per cent of the family home. The threshold is a million euro anyway but there was just a concern that you would have maybe somebody who would be asset rich but cash poor and that was one of the ways of dealing with that and that’s what we put that into the legislation at that time. One of the big problems we have is that the data in terms of the distribution of wealth is still not available so therefore it can’t be costed but I think what is acceptable is that a wealth tax will bring in significant revenues. HOC: €800 million is the figure that has been quoted before. Can you give me a figure now? A minimum figure that you think it would bring in? HOC: But sure you’re proposing it and you’ve no idea how much money it’s going to raise? PD: We’re proposing it but we’re actually not including it as a deficit reduction target. So what we’re saying in terms of wealth tax is that the money that a wealth tax takes in, whether that’s €200 million or €800 million, that that should be ring-fenced to try for a youth guarantee to get young people back to work. Now, if you look at the other economists, the Nevin Institute for example that are proposing a 0.6 per cent rate. So it’s nearly half of what we’re proposing they have different thresholds and all the rest and they reckon that that would bring €150 million. So ours is twice as high, it’s a 1 per cent rate or nearly twice as high so you argue that if it was the same type of model it would be €300 million. The Minister himself has said it would be between €400 and €500 million. Really the actual figure in itself isn’t important but nobody can cost it until we have that type of breakdown of data. But we still believe that the concept of a wealth tax is important, that a wealth tax should be used to help young people to get back to work and it should be introduced. HOC: But isn’t the property tax in effect a wealth tax? I mean I can get out of the wealth tax because I can move a lot of my assets out of the country. But I can’t move a house, a big mansion to a low tax country. PD: So therefore their assets will be based in Ireland. So that’s what will be levied, it will be their assets based in Ireland. HOC: What if they move them all to low tax country, you can’t tax them [in Ireland]. You’d be much better off if you had a property tax because you’re taxing their property in Ireland. If they’ve got a big house you can’t move it for tax purposes to a low tax country, it’s in Ireland so you tax it. So the property tax is much fairer isn’t it? HOC: So you’re admitting that bonds and stuff like that, they could move that out of the county and you would have no way of taxing them? PD: But for those domiciled in Ireland it is a global, it is on your global assets, regardless of where they’re located. That is the same practice that is in other countries where there is a wealth tax, for example, France. The key thing, to go back to your point is: the property tax compared to the wealth tax. For example, property tax has been deducted from my wages, and my mortgage at the minute is probably around €150,000. Yet the debt on my house is about €150,000 so I don’t really have an asset. For many people out there they have a mortgage of maybe €200,000 yet their house is only valued at €120,000 so what the government is actually doing is actually taxing a liability not taxing an asset. Whereas a wealth tax is about a net wealth which means that if you have a house that’s worth half a million euro but you’ve got a mortgage of €200,000 then your asset is only €300,000 and that is all that is taxed so that is a very different calculation in terms of how you would actually tax that asset. HOC: You have a proposal for a three per cent tax on online gambling. Can you name one country where this has been successfully introduced? PD: Well Ireland is about to. The government is about to introduce a tax on gambling, the Betting Bill. It’s still held up. It will go to committee stage in about two weeks time we understand. We’re broadly in support of it. It’s a one per cent tax and we believe that it should be a three per cent tax, the government’s argument is: ‘Let’s get the one per cent tax across the board and then we’ll look at three per cent’. HOC: So there is no country where it has been introduced is there? HOC: But is there any other country? PD: I’m not sure, but what I am saying to you is that the concept of a betting tax is actually going to be introduced. We believe it should be higher. We believe the government is actually of the same opinion but they take a more ‘wait and see’. Gambling is one of the few vices that haven’t been taxed adequately in Ireland. It also causes quite a lot of problems in terms of gambling addiction but we believe a three per cent gambling tax is appropriate. HOC: Your pre-Budget submission has a commitment to save €76.7 million from “professional fees and general department spend”. What is that? Has that been costed by the Department of Finance? PD: Yeah all of these proposals have been costed by the Department of Finance and in that case it would be the Department of Public Expenditure…. (breaks to look through Sinn Féin budget documentation for the specific proposals)… It’s a 15 per cent reduction in all government related professional fees including consultancy, IT, advertising, accountancy. That’s what we’ve targeted there. A 15 per cent reduction in third level education and training, saving €1.4 million. A 15 per cent reduction in travel expenses. HOC: Travel expenses. How are you going to do that? PD: Well it’s something that’s used all the time, it’s basically you cut the rate that’s available in departments in the budget, that’s available in the department, by 15 per cent. HOC: But is money that is spent on travel expenses not just money that has to be spent [as the costs arise]? PD: Not necessarily and you can see down throughout the years that the travel expenses have been cut. It’s not just a case of the cost of your flight it’s also rates of allowances that you’re able to accrue back. It’s also by tightening up. We’ve had travel expenditure cut for example in the HSE where patients can’t get access to allowances to get them to hospital in the past. We believe it’s appropriate that a 15 per cent reduction in department spend on travel would be targeted and the same in relation to advertising, accountancy and advisory consultancy. It’s about driving down costs in those areas. PD: Well we have specifically targeted pension tax reductions on those discretionary tax reliefs. So we haven’t looked at including those that are obliged to pay into their pensions which include public sector workers and that’s why the pension pay reduction hasn’t been included for standardisation. If we were to include the public sector pension tax relief then it would bring in an additional €90 million, as the Department of Finance has costed, and so we’ve decided not to include that in our figures. HOC: So public servants wouldn’t be subject to this? PD: We have no intention of standardising pension tax reliefs on low and middle income public sector workers and that’s why we have not included their pension pay reduction as part of the standardisation measure. That would have brought in an extra €90 million and we’ve excluded that from our figures. HOC: How many researchers does Sinn Féin employ to work on its economic proposals? PD: Researchers? All of the researchers are parliamentary assistants in our offices. HOC: What are their qualifications? Have you got people with economic degrees? PD: No, no, I was just going on [to say] we engage with IBEC, we engage with others. HOC: And what do IBEC say to you? HOC: IBEC would come out gunning for you at times like this. What does that say about you guys being seen as job creators? PD: No, not at all. What we’re saying to people is that if your company is employing people on wages above €100,000 we believe that you have the capacity to pay an extra 5 per cent on their PRSI.We need more money in this country. We don’t want to be hurting small or medium enterprises who are struggling. We need to ensure that money is left in people’s pockets but we also need to get money to make sure that the services are provided properly. If you are in a position where you are employing [and] you’re likely to be bigger than the local butcher or the hairdresser or the restaurant, you’re likely to be one of the larger companies. And we believe that you’ve probably got an ability to pay that extra 5 per cent PRSI on the portion that’s above €100,000 as an employer. So have you guys done any assessment of how all of these measures in your budget document would interact with each other? Have you done any assessment of whether people would move assets out of the country, or change their behaviour in relation to their income. Have you looked into any of that? PD: Well first of all we’ve looked at our proposals and we’ve asked people to look at them in terms of the impact on the economy. Our proposals are, in our view, more growth friendly than what the government has come forward with. HOC: But you would say that though. What have other people told you? PD: Well what the economists that give us advice tell us, and the reason we say that, is because actually it puts more money back into people’s pockets that are going to spend in the economy. It creates domestic demand whereas the government – and the ERSI have said this – have had the most regressive budgets in the last number of years which actually contracts domestic demand and you can see the figures in terms of growth that they’ve never hit them. So our proposals, when you put them together, with the stimulus, you could make that argument that our proposals are growth friendly so therefore you don’t have to make the same deficit reduction because if you grow the economy you don’t need to reduce or cut taxes as much. But we haven’t done that. This argument that we’ve put forward in our alternative budget is that if the government is going to go down and take €2 billion out of the economy then this is a better way of doing it. In relation to how our policies interact with each other, we ask the Department of Finance and the Department of Public Expenditure, for example, in relation to pensions issue, we asked them how would the issue of a cap on pensions and then the standardisation interact with each other and they give us back the figures on that there. So we already, we ourselves, see conflict or where there is an interaction with a number of policies we ask the Department of Finance or the Department of Expenditure to then look at costing those specific measures and see how they interact with each other. You can actually see that in some of our proposals you will actually see the tax adjustment which allows for the net effect of salary reductions: €13 million. The tax back proposals: €594 million and the partial year effect is €405 million. So out of our proposals there is a billion euro lost as a result of the adjustments that we have identified need to be made. Can I just say as well there is no facility, and it’s something that needs to be done, where you can actually just submit an entire budget or indeed a policy to any department and ask them to cost that in its entirety – it’s not available. HOC: If someone like the Fiscal Advisory Council said they would do it for you would you submit that? HOC: Have you approached them? PD: It’s not within their remit and they would probably be straying into an area that they shouldn’t stray into but there is a need for it in my view. Either the Department of Finance or not the Department of Finance on its own but within one of the departments, or within the ERSI or an independent body to be able to not only cost alternative budgets but to look at policies that government and opposition want to introduce and cost those independently. Particularly it’s of necessity in the lead up to the next general election where more than likely, if we are to follow the form of every other general election, the first week of debate if not two weeks of debate will be about: ‘Was your policy costed and who costed your policy’ and all the rest. If we had an independent unit that would do that on behalf of political parties and independents then I believe that would be of huge benefit to the public debate and discourse that we’re having. Can I also say that the Department themselves costed policies and they get them wrong all the time. The government themselves are announcing that they may have to introduce a supplementary budget in Health for example of about half a billion euro so they don’t have all of the wisdom in the Department of Finance or the Department of Public Expenditure. They get it wrong on many occasions themselves. HOC: So we’re in a complete vacuum really aren’t we? PD: It’s been costed by the same people who are costing the government’s proposals. PD: Well I don’t agree with that assessment but again you know, and I’ve been finance spokesperson for the party for a number of years, we’ve put in questions in relation to the measures that the government might want to introduce, that we might want to introduce and we’ve looked at them – they’re the costings in the budget book. So, for example, I have the costings at this point in time for if the government were to increase the marginal tax rate, the entry point to the marginal tax rate. If the government announces that it’s the costings that they provided to me that will appear in the budget book. Do not be under any illusion that there is this grand type of, you know, fountain of wisdom within the Department of Finance that looks at the interaction of all of these policies. Many of these tax policies don’t interact with each other, they’re just very much savings and they’re taxation measures. PD: Yes, yes. But we have looked at the tax, how would that impact on our tax? So we’ve asked the Department of Public Expenditure and the Department of Finance to look at that. Okay, 48 per cent tax rate or indeed a 41 per cent tax rate or whatever tax rate there’s the figures, but if we introduce this wage cut then obviously they are paying less tax so what would that mean. So we’ve asked those questions of the departments and that’s why, that’s what’s led us to these type of adjustments that we’ve calculated in. PD: I have a job and I am very thankful to the people who voted me in to do this job. Look, it’s for me and for the party, well for me anyway, it’s not a massive issue. I think it keeps us very well grounded. I think it keeps us in touch with reality. I’ve been an Oireachtas member for the last seven years. If I kept all my wages instead of employing people I probably would have €200,000 in the bank today. I don’t have that in the bank because this is the policy that the party employs. I am happy to do it. It really means that, and I am lucky my wife works as well, that we are more in tune with where people are on middle incomes. HOC: But you’re in a party. The money that you don’t take goes towards funding the party which goes towards making sure that you get reelected in 2016. PD: The money in my case goes to employing two individuals who work in my constituency office. HOC: That’s going to help you get re-elected. PD: Of course it will. HOC: So you keep your job. PD: Of course it will and then I will continue to draw the average industrial wage, personally. HOC: But the average industrial worker doesn’t have that comfort. So then is it not disingenuous to claim solidarity with the average industrial worker when really you have a lot more of the comforts that they don’t enjoy in their job? PD: Well it’s not personal comforts, if the comfort is that I employ two additional secretaries to provide a better constituency service. PD: The party doesn’t actually get that money, it’s me that gets it, I am the employer. But can I say I am glad for your vote of confidence that I am secure in my job but the people will decide in about 18 months whether I am and will decide every five years. But yeah look I could decide to spend that money if I was in any other political party anywhere I wanted. I could have it resting in my bank account today. I’ve decided not. It is a benefit to our vision for the party because the more people we have working for us, the more people work in our constituency office, the better service that we’re able to give. It’s not a big issue at the end of the day, it’s not something that we’re out there shouting and screaming about. PD: We continue to be asked about this. PD: Well we’d have to make whatever adjustments that we’d have to make. That’s normal, that’s just the way it works. If the money isn’t available then the money isn’t available. But we’d also want to make sure that ministerial pay comes back down to line, we’d want to make sure that a lot of the perks in terms of chairpersons of committees, Ceann Comhairle, all of that there actually reflects the reality of where Ireland is today and the pressure that people are under. Now that’s available to everybody, that’s a policy position that we want to introduce. In terms of the average industrial wage, it’s a policy position internally within the party, it effects just Oireachtas members, MLAs and so on and it’s something that we do because we believe it’s right and I think it’s fair enough.It does keep you in tune, no matter what it is, if you’re missing your mortgage payments, it keeps you more in tune with other people who are missing their mortgage payments than if you were sitting on €100,000 and having this money just resting in your bank account. HOC: Do you want to add anything else? PD: I think the economy is evolving. It evolves all the time, the needs of the public evolve all the time so like every year we will look at our proposals that we made in our alternative budget, see if they’re fit for purpose for the following year, try and progress on some of them. So we’re at that point where we’re looking at areas. We’re also very keen on looking at departments that are really, really hard pressed as a result of no increase in spending and indeed a decrease of spending and that’s an area thats a big challenge that we’ll be looking at in our alternative budget. But we will be seeing the same key proposals within our alternative budget. You will see the scrapping of the property tax, you will see a budget that will show how water charges does not need to be introduced, you will see the 48 per cent tax rate on high income earners and you will see a fair distribution of wealth. You will also see, in my view, the 296,000 workers being taken out of the USC tax net. HOC: Joan Burton said to me the other day that is effectively abolishing USC, is it not? PD: No, that’s crazy stuff. USC, from the top of my head, brings in about €4 billion. Abolishing the USC for about 296,000 workers, which are people earning below the minimum wage, would I think cost about €140 million or so. So it’s nowhere near abolishing USC. PD: It’s a compliment in a way because those parties make up the consensus. They make up the consensus for cuts, they very much share the same space in terms of their economic view. The fact that a party such as Sinn Féin are there challenging the consensus and the fact that they can only deal with our proposals by saying they’re fantasy is actually a compliment because they’re scared of the type of change that we want to bring about and they’re scared to actually engage with a real honest debate about should we actually increase tax on the highest earners in society so that we can have better public services. They are afraid of that type of debate because they know that it’s a debate, in my view, that they will lose, that people will want not to be squeezed with taxation but the want a fairer system and that’s all that we’re talking about. It’s about bringing fairness to the taxation code, making sure there’s enough there to fund public services that are needed whether that is in education or health or social protection, it’s about that. But it’s also about identifying efficiencies, like we have last year, and that’s something that we want to progress on, is look at areas where we can drive efficiencies. We identified a number of them in the Department of Health last time. It is very difficult to do it because you don’t have access to the departments. Governments have access to huge suite of civil servants and all the resources that are available but it’s something that we want to continue to drive to see if there is ways that you can actually drive efficiencies within departments to make sure that the money that is given to departments goes more into frontline spending. HOC: Finally, is the 48 per cent tax rate a red line issue for going into government? PD: You don’t make any tax rate a red line issue. For example, a 48 per cent tax rate on income above €100,000 can be achieved in a number of ways. So it’s the principal. Do we want to see those earning above €100,000 pay more tax. Yes, that’s very clear. Is there more ways to do it? Of course. You’re bringing in €365 million. You could probably bring in €365 million by increasing USC of those above a €100,000 to maybe 5.5 per cent. So it would be silly to actually make a rate a red line issue or even a policy issue as such because the policy continues to change and you need to be able to change and adapt all the time. HOC: So right now only the property tax [is a red line issue]? PD: The only commitment we’ve given is in relation to property tax and the party is putting together it’s own programme for the next election and those commitments will be made at that time. Read: Sinn Féin may be getting ready for government, but is it ready for questions about policy? Shinnernomics: Opponents call them fantasy, so how realistic are Sinn Féin’s budget proposals? Email “Fantasy or reality? Pearse Doherty wanted to explain 'Shinnernomics', so here's what he said... ”. Feedback on “Fantasy or reality? Pearse Doherty wanted to explain 'Shinnernomics', so here's what he said... ”.